The filmmakers attempted to condense the Ardennes Counteroffensive, a World War II battle that stretched across parts of Germany, Belgium and Luxembourg and lasted nearly a month, into under three hours. They also shot parts of the film on terrain that did not resemble actual battle locations. This left them open to criticism for lack of historical accuracy, but they claimed in the end credits that they had "re-organized" the chronological order of events to maximize the dramatic story. 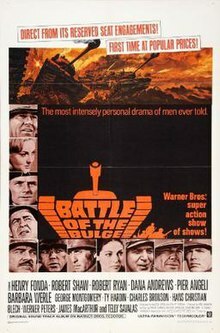 Unlike most World War II epics, Battle of the Bulge contains virtually no portrayals of actual senior Allied leaders, civilian or military. This is presumably because of controversies surrounding the battle, both during the war and after. Though Allied forces ultimately won the battle, the initial German counteroffensive caught them by surprise and caused many casualties. It is December, 1944. Military Intelligence officer and former policeman Lt. Col. Daniel Kiley (Fonda) and his pilot, Joe (Robert Woods), are flying a reconnaissance mission over the Ardennes forest. Spotting a German staff car the plane buzzes the car and photographs the officer. Alarmed, the chauffeur flees the car, leaving the engine running. "Petrol is blood," rebukes the German officer, marking a theme of the film, the German shortage of fuel. In a subterranean lair, it is revealed the officer is Col. Martin Hessler (Shaw), a fictional Panzer tank commander loosely based on SS-Standartenführer Jochen Peiper. Hessler is briefed by his superior, Gen. Kohler (Werner Peters), on a new German attack, piercing west against the American lines. Kohler points out a clock with a 50-hour countdown, which is the time allotted for the operation, beyond which Germany has no resources for full-scale attack. At the same time German soldiers disguised as American troops, led by Lt. Schumacher (Ty Hardin), are tasked with seizing vital bridges and sowing confusion behind the Allied lines. Meanwhile, Kiley returns to headquarters where he warns that the Germans are planning one more all-out offensive. His superiors, Gen. Grey (Robert Ryan) and Col. Pritchard (Dana Andrews), dismiss it out of hand: all available intelligence points to Germany not having the resources and manpower to launch another attack. Hessler, having become concerned about the abilities of his tank commanders after his orderly, Conrad, (Hans Christian Blech) points out the staggering losses Germany has sustained since the war began, reviews them, discovering they are all young and lacking in experience. Overhearing his criticism, the commanders break into a chorus of Panzerlied, restoring Hessler's faith. Hoping to uncover more proof, Kiley visits a US infantry position on the Siegfried Line under command of Maj. Wolenski (Charles Bronson). A patrol led by Lt. Weaver (James MacArthur) and Sgt. Duquesne (George Montgomery) capture some young and obviously inexperienced German soldiers. Kiley concludes that experienced German troops have been replaced by these men and withdrawn for an offensive, but Pritchard dismisses this as well, rebuking Kiley for "crackpot hunches" and determining to relieve him of duty. Hessler launches his attack the next day. Awakened by the noise of German tanks, Wolenski leads his men into the wooded area of the Schnee Eifel, where they try to fight them off but are overrun. A group of Allied tanks led by Sgt. Guffy (Telly Savalas) also attempts to slow the Panzers, but their tanks' weak guns and thin armor make them ineffective, forcing him and his crew to retreat. Lt. Schumacher and his disguised troops capture the only bridge over the Our River capable of carrying heavy tanks. Hessler continues his spearhead toward Ambleve, while being observed by Kiley, who also discovers that a German truck is carrying empty fuel drums. Schumacher later takes control of a vital intersection of three roads connecting Ambleve, Malmedy and the Siegfried Line. He sabotages the road signs, and the rear echelon of Wolenski's troops take the wrong road to Malmedy; almost the entire unit is captured and massacred. Lt. Weaver manages to escape, but Duquesne is killed. US soldiers become suspicious when they witness Schumacher's "military police" lay explosives incorrectly on the Our bridge, and his masquerade is revealed, though too late to stop Hessler. When Kohler orders Hessler to bypass Ambleve, Hessler replies that the Americans have no concept of defeat, citing that they will ship things as trivial as a fresh chocolate cake to their front-line troops. He feels he can break their will to fight, and Kohler gives him the night to do so. Hessler's tanks and infantry storm Ambleve, finally taking the town. Although many Americans, including Wolenski, are captured, Grey, Pritchard, Kiley and others escape to the River Meuse. American forces regroup and begin to reorganize for a counterattack. Facing the dangers of a foggy night, Col. Kiley conducts an aerial reconnaissance in an attempt to locate the main German spearhead. He orders the pilot to shut off the engine and glide in an attempt to listen for enemy tanks. Suddenly, through a gap in the fog, he spots Hessler's tank column heading toward American lines. Kiley radios in the coordinates, but his plane is hit by German fire and crashes near an American fuel depot. In Hessler's command vehicle, Conrad finally confronts the Colonel about his warmongering ways after Hessler boasts about the war going on forever, meaning Conrad's sons will have to become soldiers and fight. Hessler is unmoved, transferring Conrad to the fuel battalion. Meanwhile, Gen. Grey's forces, with the Meuse at their back, prepare to fight off Hessler. The outgunned, outarmored American tanks are systematically destroyed, but at the cost of the Germans burning up much of their fuel. Guffy encounters Weaver, who has taken command of a small force of wounded men, and the surviving Americans head to the depot, the same one where the wounded Kiley is recovering. Aware of the German fuel shortages, Hessler leads a detachment toward the depot to capture its stocks, Conrad watching him go. Weaver and the stragglers arrive first. Weaver recognizes Lt. Schumacher, who is still posing as an American MP and whose men have taken control of the depot, but Schumacher doesn't recognize him. At Weaver's signal, he and his men open fire on the disguised Germans, killing them all. As Hessler's column approaches, the US defenders flood the road with gasoline and set it ablaze. The young German crews abandon their machines in terror, only to be shot by the Americans or consumed by the flames. Abandoned by his crew, Hessler goes it alone, only for his tank to be destroyed by a burning fuel drum. General Gray arrives in time to see the Panzers explode. Out of fuel, the remaining Germans give up the attack, marching back to Germany. Conrad, bringing up the rear, discards his rifle and cartridge belt, and confidently marches on, his personal war over. The final tank battle is a rough depiction of the Battle of Celles on December 26, 1944, where the U.S. 2nd Armored Div. smashed the German 2nd Panzer Division. The film creates the false impression that large numbers of American tanks sacrificed themselves against the heavy Tiger IIs and in the process lured the enemy off course, which caused them to run out of gas. In reality, they were already stranded. The tanks used, despite the claims of the producer in an interview, which is one of the DVD extras, are not historically accurate. Although the M24 Chaffee light tanks used in the scene were World War II-era vehicles, they were not in use in the scale shown in the film and were relatively rare. The US M47 Pattons representing German King Tiger tanks and the M4 Shermans, as represented by the M24 Chaffees, contributed much to the myth of the superior size and firepower which US armor had to contend with. However, in World War II, while it was true that, tank for tank, the Tiger II was superior to the Sherman, most of the anti-tank duties were actually the task and work of the tank destroyer units. Aside from the initial American encounters with the German offensive is the absence of cold weather and snow, which were the conditions in which the real battle was fought. There is no trace of snow at all in the film's major tank battle scene, and some battle scenes were fought in flat and bare territory, unlike the mountainous, forested and grassy nature of the Ardennes. The film was shot on location in the Sierra de Guadarrama mountain range and Madrid, Spain. The sequence with Lt. Schumacher and his men was based on Operation Greif, the plan to parachute English-speaking Germans using American equipment behind American lines to sow confusion and capture the bridges. Absent from this movie is the response by General Patton, whose Third Army relieved the siege of Bastogne. Also, there are no African-Americans in the movie even though the 761st Tank Battalion (The Black Panthers) played a role in Patton's Third Army. Indeed, there is no reference to British forces in the area, but British troops were largely kept behind the Meuse River and thus almost entirely out of the fighting. Also not mentioned is General Eisenhower's decision to split the Bulge front in two, ceding temporary command of two American armies to Field Marshal Montgomery in the northern half of the Bulge; the film implies a totally American operation. There is also no mention of the role of Allied air power hitting the Germans hard at the first sign of clear weather. In fact, in the film, the sky during the battle is clear and partly cloudy. The film's opening narration, by William Conrad, mentions both Montgomery and Patton but is inaccurate: "to the north, stood Montgomery's Eighth Army. To the south, Patton's Third Army." In fact, Montgomery's northern command was actually the 21st Army Group. The Eighth Army, Montgomery's previous command, was actually in Italy at the time of the Battle of the Bulge. Although Patton was actually in charge of Third Army during the battle, it was part of a much larger American force in the south and was one of four American armies of the 12th Army Group under General Omar Bradley. The film recaptures the major aspects of the battle, depicting how the inexperienced replacement American units stationed in the Ardennes were initially overwhelmed and how confused the situation became. It points out the superiority of heavy German tanks and their major weakness, a lack of fuel. Some early scenes, showing discussions among German officers, accurately depict the Third Reich's desperation to cut American-British supply lines to neutralize the Allies' huge logistical advantage. Screenwriter Bernard Gordon claims to have rewritten John Melson's original screenplay. Some of the original choices for director were Richard Fleischer, who turned it down; and Edward Dmytryk, with whom Jack L. Warner of Warner Bros. refused to work. Technical advisor on the film was Maj. Gen. (then Col.) Meinrad von Lauchert, who commanded the German tank division that made the most headway in the actual battle. For an economical price and with no restrictions, the Spanish army provided an estimated 500 fully equipped soldiers and 75 tanks and vehicles, some of World War II vintage. The film was one of the most popular movies at the British box office in 1966. The original VHS release of the film for home video use was heavily edited to fit on one VHS tape and used a full screen "pan and scan" technique often employed in network telecasts of widescreen motion pictures. The 1992 Laserdisc and 2005 DVD releases run at their full length and are presented letterboxed in the original 2.76:1 aspect ratio. A Blu-ray release followed in 2007, also in the original 2.76:1 aspect ratio. ^ "Most popular star for third time." Times [London, England] 31 Dec. 1966: 5. The Times Digital Archive. Web. 16 Sept. 2013. Wikimedia Commons has media related to Battle of the Bulge (1965 film). Marcus Wendel (May 14, 2006), "Heer Units". Viewed December 26, 2006. This page was last edited on 8 April 2019, at 01:22 (UTC).